Welcome to the Essex Aquatics pond cleaning page. 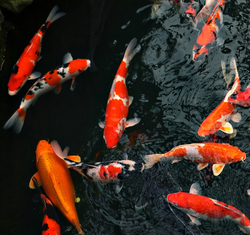 Here at Essex Aquatics we specialise and are vastly experienced in professional pond cleaning we are situated in Chelmsford, Essex but cover the whole of Essex, London and other surrounding areas. We clean all ponds regardless of size so the smallest garden right up to lake size. We can also clean any other water features, pools etc that you may have. Please ring 07732197496 or email info@essex-aquatics.co.uk to talk to us about your project. Why get your pond cleaned? Over time ponds become dirty as a results of numerous factors including; Uneaten fish food, fish waste, leaves and other organic waste falling in the water. These then collect and begin to slowly rot on either the pond bottom or various planting shelfs in the pond, producing a sludge or silt. The breakdown of this sludge, silt or dirt produce gases, affect pH of water and overall water quality. If left for too long this will affect fish health by adding stress through poor water quality making them more susceptible to disease and can even lead to deaths to fish and other important pond life. Filters will slowly pick up and remove a small amount of solids but impossible for them to completely remove most of the waste. By getting your pond professionally cleaned by Essex Aquatics you remove all dirt and harmful materials minimising this risk. It also leaves you with a pristine pond for you to enjoy your pond, fish and other pond life. What happens when you get your pond cleaned? 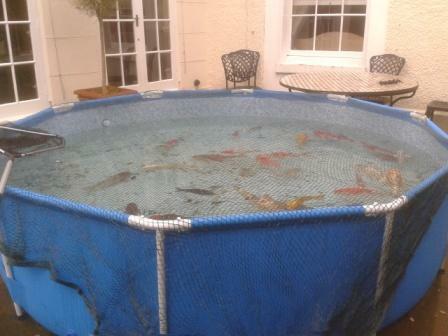 We completely empty your pond, storing all fish plants and other life in a suitable temporary pond. All dirt and waste is removed by vacuuming or manually removed. All sides and bottom is washed down using a pressure washer. Pond is filled back up and all pond life safely put back. Contact us today about getting your pond professionally cleaned by Essex Aquatics. Call Elliot on 07732197496 or email info@essex-aquatics.co.uk, most ponds can be quoted over the phone or by a quick email however we are happy to arrange a free visit for a no obligation quote.